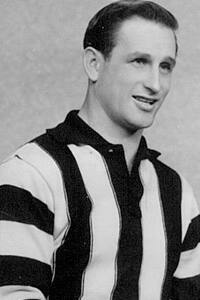 Frank Tuck played 131 games for Collingwood between 1950 and 1959. The President, Board, staff and members of the Collingwood Football Club are mourning the passing of champion and former captain Frank Tuck. Frank is revered at Collingwood. He was named Best Finals Player in 1952, finished third in the best-and-fairest in 1957 and became a Life Member in 1959. The club would like to extend its deepest sympathies to the Tuck family. Side by Side We Stick Together. Club historian Michael Roberts has written a tribute to Tuck and his days in the Black and White jumper. On Friday, around a dozen survivors of Collingwood’s fabled 1958 Premiership team gathered together for an informal lunch in Fitzroy. What they didn’t know was that, just a few hours earlier, their captain from that season, Frank Tuck, had passed away in Corowa at age 84. Tuck didn’t actually lead the team into battle that famous day in 1958, after a torn thigh muscle kept him out of the action, but his leadership that year was a key factor in the Pies’ improbable triumph. Former teammate Ken Turner, who was at Friday’s lunch, said that Tuck was a great leader and one of the hardest footballers he had seen. “For his size - he wasn’t really that tall for a centre half-back - he was one of the toughest guys I played with. One of the toughest I ever saw, actually. Tuck joined the club from Strathmerton in 1950 and went on to play 131 games, captaining the side for two seasons. He was one of football’s unluckiest players: in addition to missing out on the 1958 flag through injury, he’d missed the Magpies’ 1953 Premiership through suspension. Click here to read Michael Roberts' full biography of Frank Tuck's career on Collingwood Forever.